Congratulations to Loni Harwood, Winner of Event #60 $1,500 No-Limit Hold'em ($609,017)! 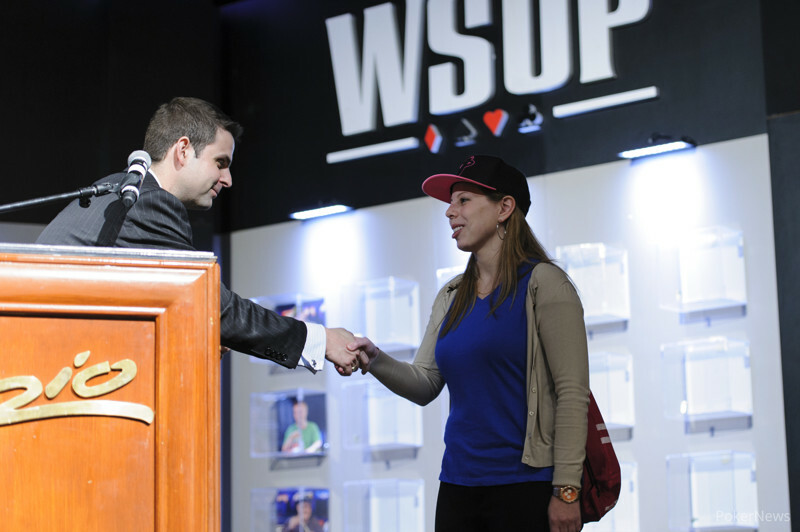 Just last week, Dana Castaneda became the first woman not named Vanessa Selbst to win an open event at the WSOP since 2007. Well it appears that Castaneda started a trend, as WSOP Circuit Grinder Loni Harwood has just won another bracelet for the ladies, taking down Event #60 $1,500 No-Limit Hold’em. Along with adding her first bracelet to the two Circuit rings she already owns, Harwood will take home $609,017. At the start of the day, there were 15 players, and in less than a level, the final table was determined. The action started immediately when Yongjun Lu and Ryan Julius were eliminated on the same hand when Hiren Patel busted both with his ace-king. From there, Jason Reynolds busted in 13th, Ashwin Sarin in 12th, Maksim Tyurin in 11th, and Cormac Ohiggins. It took over an hour to lose our first player, and it was the aforementioned Patel. He lost most of his chips in a hand where his flopped top pair and flush draw couldn’t beat the pocket aces of Harwood, and he was eliminated shortly after by Yongshuo Zheng. Another forty minutes went by before Bijon Notash went out in 8th, and then there was the hand of the final table. Harwood got the rest of her chips in preflop holding , but she was in dire straits against the of Yngve Steen. Harwood managed to flop a broadway draw when the flop came . The turn bricked, but she caught the four outer on the river, as the came. Harwood scored a massive double up to take the chip lead, and she never looked back. Harwood eliminated Cy Williams five minutes later when her queens held against his tens, getting us to six handed play. It took over 90 minutes before Daniel Cascado’s pocket sixes couldn’t win a race against Harwood’s ace-jack, and he took home just over $100,000 for his efforts. Not long after, a short stacked Asi Moshe shoved with , and he was in rough shape versus the of Zheng. He was never able to catch up, and Moshe was the fifth place finisher. Steen shoved several times with his short stack, before finally getting caught by Harwood. Steen held king-seven, and he was in rough shape against Harwood’s king-queen. A queen on the flop all but ended things, and Steen was knocked out fourth place. Mika Paasonen looked to be in prime position to get to heads-up play when he got it all in with against the of Zheng, but an ace on the flop changed the tide. Paasonen was not able to catch up, and he busted shortly after at the hands of Harwood. Heads up play lasted for just under two hours, with Harwood never giving up the chip lead. Zheng managed to get a double up, but the bracelet was destined for Harwood. On the final hand, Zheng rivered a broadway straight, but that card also gave Harwood a winning full house, giving her the title. A huge congratulations to Loni Harwood, who becomes the third WSOP Circuit grinder to win a bracelet in Las Vegas this summer, and the fourth of the whole summer if you count Jonathan Hilton winning the National Championship in New Orleans in May. Not only that, but Harwood jumps up to 3rd in the WSOP POY race, as this was her third final table of the series. We hope you enjoyed all the coverage from the Rio today. Congratulations again to Harwood, and so long from Las Vegas! Action began with Yongshuo Zheng who raised to 215,000. Harwood opted to call from the big blind. The flop came down and Harwood checked to Zheng who fired 250,000. Harwood just called. The turn came down the and this time, both players checked. On the river, Harwood decided to lead out with a big bet of 600,000. After a few seconds of thinking Zheng announced that he was all in and Harwood snap called. Zheng had rivered the nut straight with , but he was second best. Harwood had also hit the river in a big way, by making a full house with her . With that, Zheng was eliminated in second place, while Harwood was crowned the champion of Event #60: $1,500 No-Limit Hold'em. 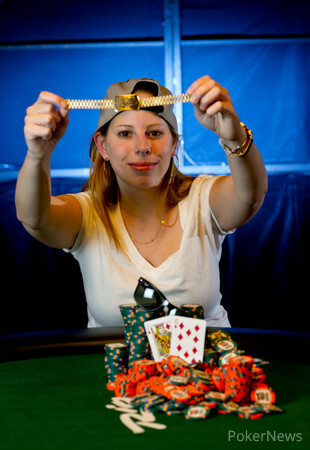 Loni Harwood is the second woman at the 2013 World Series of Poker to win a gold bracelet in an open event. She joins Dana Castaneda in that elite category this year. -Harwood opened to 215,000 from the button. Zheng called. The flop came down and Zheng checked to Harwood who fired off a bet of 215,000. Zheng opted to put in a reraise to 460,000. With action back to Harwood she made it a total of 1,100,000 which drew a fold from Zheng, awarding the big pot to Harwood. -Zheng raised to 220,000 from the button and Harwood folded. -Harwood opened to 215,000 and was able to take down the pot. - Loni Harwood raised it up to 215,000, and Yongshuo Zheng called. The flop came , and both players checked. The fireworks went off when the hit the turn. Zheng fired out 280,000, and Harwood thought for about 45 seconds before grabbing raising chips. She eventually put out 620,000, and Zheng only thought for about 30 seconds before moving all in. Before Zheng could even finish sliding his chips in, Harwood's hand was in the muck, and Zheng took down the big pot. - Harwood got a walk. - Harwood raised to 215,000, and Zheng three bet to 580,000. Harwood folded, and Zheng took down the pot. - Harwood raised it up to 215,000. Zheng called, then check folded on a flop of after Harwood bet 215,000. - Zheng raised it up to 200,000, and Harwood folded. - Harwood made it 215,000 to go, and Zheng folded. - The players exchanged walks on back-to-back hands. - Zheng raised it up to 215,000, and Harwood kicked her hand in. -Harwood raised to 215,000 and she took down the pot with that opening raise. -Zheng limped on the button and Harwood checked her option. The flop came down and Harwood checked to Zheng who bet 100,000. That was enough to get Harwood to fold and Zheng was pushed the pot. -Harwood raised to 200,000 on the button. Zheng called. The flop came down and Zheng checked called a bet of 170,00 from Harwood. The turn was the and Zheng decided to change it up and lead with a bet of 430,000. Harwood folded and Zheng was awarded the pot. -From the button Harwood raised to 165,000 and took down the pot. 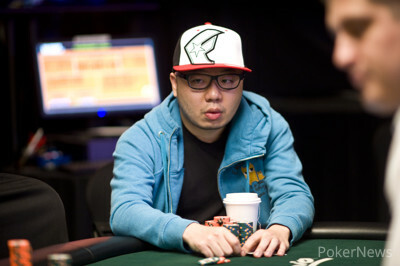 -Zheng raised to 165,000 from the button and he took down the pot. -Harwood opened the pot with a raise to 165,000 and she was called by Zheng. The flop came down and both players checked to see the on the turn. On that turn Harwood fired 140,000 and that was enough to claim the pot. -Zhen raised to 165,000 and took down the pot. - Yongshuo Zheng raised it up to 175,000, and Harwood made the call. The flop came down , and Harwood check folded to a bet of 120,000 from Zheng. - Harwood raised it up to 165,000, and Zheng made the call. The two checked through a flop of , and the turn brought the . Zheng fired out 180,000, and Harwood tossed in the call. The river was the , and Zheng checked to Harwood, who fired out 225,000. Zheng spent a minute or two in the tank before sliding his cards to the dealer, and Harwood took down the pot. - Zheng raised it up to 165,000, and Harwood decided to play for more. She reraised to 435,000, and Zheng tossed the call in. The flop brought all kings, , and Harwood fired right out with a bet of 420,000. Zheng tanked for about 30 seconds before kicking his hand in, and Harwood took down one of the biggest pots in the heads up battle so far.